Since 2012, Brassica farmers across diverse regions of SA have observed a new disease called ‘Brassica stunting disease’. The disease affects various Brassica species, but cabbages (Brassica oleracea var capitata) appear the most affected. The disease is characterized by stunted plants, flattening and sometimes purpling of the leaves, side shoot development, vascular discoloration in the stem and/or midrib of leaves, poor root development, low yield and low quality of the final product, thereby reducing the market value (Fig 1). The impact of BSD on cabbage production can be severe. If plants are infected at an early stage, their growth will be severely stunted and no head will be formed. If they are infected at a later stage, the size of the head produced will be greatly reduced and a black ring, due to vascular discoloration, will be clearly visible in the stem. In order to identify the causal agent(s) of the disease, a research project was initiated at the University of Johannesburg in 2013. During infection trials carried out between 2014 – 2016, it was determined that BSD is not seed, soil or water- borne and is caused by a pathogen that is transmitted by a flying insect. In 2015, It was shown that a virus, called Turnip yellows virus (TuYV), transmitted by the green-peach aphid (GPA) (Myzus persicae) (Fig. 2), is associated with the Brassica stunting disorder. Furthermore, using a molecular detection technique (RT-PCR), TuYV was detected in all symptomatic cabbage plants collected from the Limpopo, Gauteng, North West, Kwazulu Natal, Eastern Cape and Mpumalanga Provinces between 2013-2016. It is spread by Brussels sprouts, turnips, swede, kale. It also infects lettuce, beans and many. TuYV has been found widespread in Europe, the UK and recently in Australia, in areas of intensive brassica production, where in some years, all plants in commercial crops are infected. However, unlike with BSD in SA, in the UK and Europe TuYV infection often goes unnoticed as the virus rarely causes clear symptoms. The virus does however dramatically reduce yields, especially when plants are infected early in the growing season. 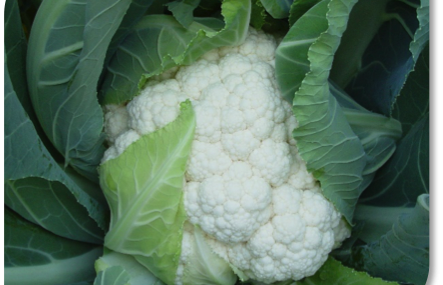 In an attempt to determine the host range of BSD, eight Brassica species were evaluated in an infection trial in 2015 and 2016. Five species, including broccoli (Brassica oleracea L. var. botrytis L.), cauliflower (Brassica oleracea L. var botrytis), kale (Brassica napus) and canola (Brassica napus) showed typical BSD symptoms, but chinese cabbage (Brassica rapa), mustard (Brassica rapa L.) or oilseed radish (Raphanus sativus) did not. TuYV was also detected in all the symptomatic cabbages and other hosts screened in the trail using RT-PCR, but absent from all the uninfected plants. aphids trapped and in the representative number of aphids from each species. In 2016, a total of 4476 aphids were trapped and in 2017, only 2834 aphids were collected. Of particular interest was the significantly lower number of M. persicae (the aphid species considered as the most important vector of TuYV) that was collected in 2017. In 2016, a total of 2639 M. persicae insects were collected, corresponding to 58% of the total amount of aphid samples collected, whereas in 2017 only 288 M. persicae insects were collected, accounting to only 10% of the total aphid samples collected. Most interestingly, disease incidences between the two years also differed significantly, i.e. 95% infection incidence in cabbages in 2016 vs 54% in 2017 and this variation in disease incidence seems to correlate with the lower number of M. persicae insects present in the cabbage field in the 2017 season. The presence of TuYV-in the collected aphids were also monitored using RT-PCR and a total of 14 aphid species, including M. persicae, Aphis spp., Acythosiphon kondoi and Rhopalosiphum maidis as the most predominant species, were positive for carrying TuYV and can be considered potential vectors. valuated a thiamethoxam seed treatment thiamethoxam and imidacloprid seedling drenches and(20 000 plants) and was based on natural, field infection in Brits. Preliminary results indicate that the various chemical treatments reduced aphid infestation [based on total aphid counts on 60 plants per treatment over an 11 week period (Fig 3): seedling drenches (51 – 233 aphid count); seed treatment (269 – 1861 aphid count) in comparison to the untreated controls (3692 aphid count)] and reduced infection incidences on the treated plants [seedling drenches 8% – 15% infection; seed treatment 16% – 43% infection] in comparison to the untreated controls (54% infection) (Fig 4). Please report occurrences of this disease to: If you have seen any of these plants infected with virus-like symptoms or require further information, contact Dr. Lindy Esterhuizen, UJ, via phone 011-559-3352 or email Lesterhuizen@uj.ac.za.